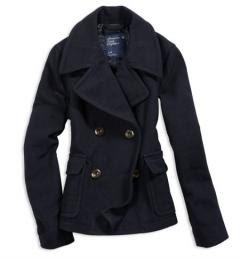 OMG I am in love with this peacoat! I have it in a shorter version but am dying for this one! Hint Hint to the Hubs for Christmas!! Holy Hell Batman I love this coat! The color is adorable & so on track with this season. It looks warm and comfy as well, which is always a must in my world. Not sure how in love with this I am but kinda liking the high neckline!